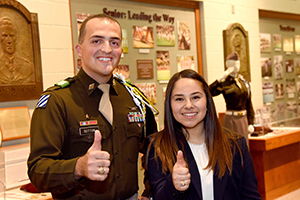 The 2017 Trustees' Outstanding Student Award recipients Joshua Sutton and Brenda Castillo at the Sanders Corp of Cadets Center. Through a generous gift from Susanne and Melbern Glasscock ’59 and other former trustees, the Texas A&M Foundation Trustees’ Outstanding Student Award was established to provide public recognition and a minimum $2,500 monetary award to an outstanding graduating senior at Texas A&M. Recipients of the award have distinguished themselves in a variety of ways, but primarily are judged on their achievements while overcoming personal or family financial challenges. Candidates for the award demonstrate financial need and have received one or more scholarships funded through the Texas A&M Foundation. The award is intended to give recipients a boost in the next phase of their lives after graduation. The award recipient will be notified in March 2019 and is required to attend the Texas A&M Foundation’s outgoing trustee dinner in May 2019 to make a two-minute acceptance speech.